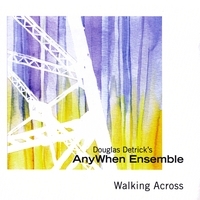 The Douglas Detrick's AnyWhen Ensemble's "Walking Across" brings together a diverse range of influences in a dynamic and engaging improvised chamber music. This is a different kind of group, with a different kind of mission. The AnyWhen Ensemble brings a diverse collection of musical influences together into a cohesive and engaging improvisational chamber music. AnyWhen draws from musical genres ranging from classical and new chamber music, traditional and contemporary jazz, and free improvised music, as well as rock, electronica and folk music. The music is intimate and personal, blending the spontaneity of improvised music with the balance and form of chamber music.